LEAD CREATIVE SCHOOLS – LADYWELL GREEN INFANTS How can we help our Year 1 & 2 pupils to engage enthusiastically with writing and develop imagination, self-expression and fine motor skills? Lead Creative Schools (LCS) is a wonderful scheme throughout Wales to bring artists into schools to work alongside teachers to develop creative approaches to teaching literacy, numeracy and digital competency. In Ladywell Green, I got to collaborate with a fabulous teacher, 16 children who thought they didn’t like writing and we had a fabulous time playing! Throughout the project we went on adventures, treasure hunts and set challenges for each other. The children built up core and finger strength through dancing and pretending to be animals. We made and played in and with storyworlds; held a character fair and created atmosphere orchestras. We used the idea of ‘story in the palm of your hand’ to create lots of stories and each child wrote their own book. The children were selected from three different classes and at the end of the project, they spent a day being teachers in their own classrooms, passing on some of the skills they had learned. For a description of how we did it, how fantastic the children were and how the children designed and created the garden please click here: Project report for Earnest Cook with pics. I loved this project. Working in collaboration with fabulous artists and a wonderful, truly child-led school, we journeyed together on fantastical adventures and created a beeping, flashing, whirring word machine! I’ve been working the English Folk Dance and Song Society as part of their project, The Full English. They have recently completely digitising their huge archive and now it is all online – an amazing resource! The Full English includes all sorts of projects in a wide variety of educational settings to celebrate the access and explore different ways of working with the material. My project was a collaboration with Queensbridge School, musician John Kirkpatrick and mentee, Beth Gifford. All of Year 7 went off timetable for a week to create a performance based on a ballad printed in Birmingham. Six classes concentrated on different aspects of the performance to create an extravaganza including morris dancing, singing, music, storytelling and drama. If you would like to read a write-up of the project, please click here. Photos coming soon. Once again I teamed up with the marvellous Fiona Collins and Wrexham Country Parks. 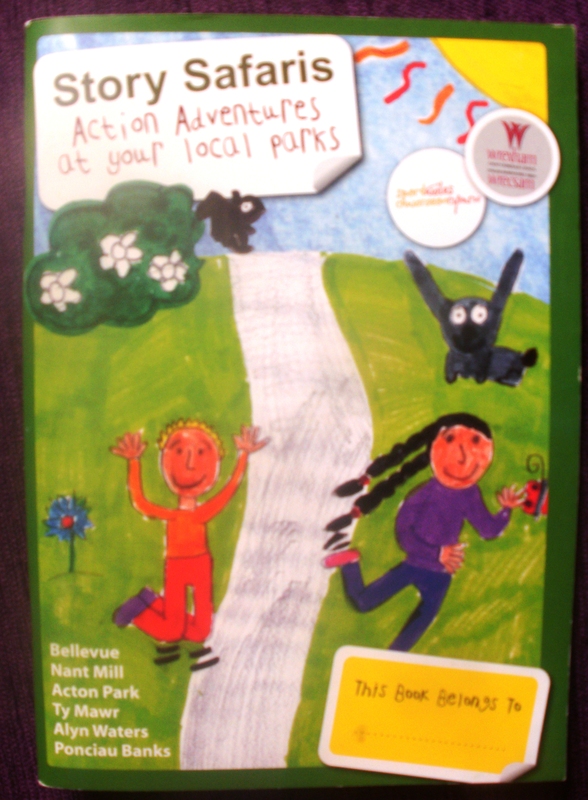 We played, jumped, ran, skipped and danced in six of the country parks with children from local schools, to create a book of new active stories for the parks. I obviously can’t talk to snakes… it’s escaping! They let me in the drivers carriage of the real Hogwart’s Express! In 2003 I was approached by American tour company, Beyond Boundaries, to be part of Harry Potter inspired trips. I was already a fan of the series (then in its infancy) and was delighted to be part of the team and have continued to contribute to the trips ever since. My role within the trips is to celebrate the wealth of British, Norse and Irish folklore and tradition that J. K, Rowling used as the bedrock of her series, rather than to retell any of her material. It has been a delight to explore the themes touched upon in the Harry Potter books and my respect and admiration for the author have continued to increase with each book and trip as I’ve discovered how deeply researched and tied in even the most casual throwaway line can be! The trips have taken me all over England and Scotland to have a huge amount of fun: banqueting in Oxford colleges and Edinburgh Castle; pushing the sweet trolley on the steam train used in the films for the Hogwarts Express; visiting a hand of glory in Whitby Museum; playing land based quidditch at Alnwick Castle; visiting lakes in caves at Wookey Hole…the list goes on and on! Their are a variety of trips available, visiting London, Oxford, Edinburgh and Glencoe. There are also wizard school castle based holidays where you can experience student life living in a castle and attend a variety of magical lessons. The HP fan trips have been an opportunity to introduce fans to the British ballad and storytelling tradition, telling the stories of Britain in the landscape where they are so deeply rooted. During the spring term Fiona Collins and I mentored a group of year 9/10 students at Selly Park Technology College preparing them for their Bronze Arts Award. Over a period of weeks the students explored a variety of storytelling techniques and organised a performance of stories and riddles within school. The students all came to the Young Storyteller of the Year Competition on 13th March in Birmingham and either performed in the competition or assisted the judges and took part in the deliberation process. The whole day was brilliant – an excellent opportunity to hear professional storytellers, perform stories in a professional theatres and meet other young people interested in storytelling. All our students have now successfully acheived their Bronze Arts Award. This project took place at the Bridge School with a core group of 14-18 year old students with moderate to severe learning difficulties. The aim was to create and deliver a project to support students on a creative journey. One week was used to introduce us as artists and our artforms, to introduce the idea of art as a way to explore and question as well as self-expression, to learn and experiment with a variety of artforms and skills, all through the key media of storytelling and visual art. A second week focused on our students giving a storytelling performance developed during the first week to groups of primary school children (with a variety of special needs) and mentoring the primary school children on a one to one basis to pass on some of the visual art techniques learned. Newport is a town layered with story and memory. The canal remembers busier days crowded with boatmen, Chocolate Charlie bringing pocketfuls of sweets back from Cadburys for the local children and harsh winters of frozen barges. Three fish swim on gates, walls and flags, heading towards the King, leaving prosperity in their wake. You may still catch a glimpse in a window of Elizabeth Parker in her wedding dress, waiting all her life and beyond for her fiancee. When night falls, Madam Pigott haunts the roads and lanes watchful of her chance to take revenge on any young men out alone. Throughout September and October I worked with dancer Rose Gordon and choreographer Bettina Strickler on a fantastic ‘Find Your Talent’ and DanceXchange collaboration to celebrate the history, folklore and people of Newport. We collaborated with several schools and community groups in Newport to gather, combine, retell and celebrate stories of Newport. The project culminated in a fantastic Hallowe’en performances with two marvellous young storytelling tour guides leading audiences around the Madam Piggott exhibition and a school haunted by ghostly dancers. This project was a collaboration between DanceXchange, Telford and Wrekin Libraries, and High Ercall and Crudgington Primary Schools. I worked with dancers Emma Burns and Laura Dredger using Shropshire myths and legends to inspire dance with KS2 children. Working with dance was a new and inspiring process for me. Our sessions were full of experimentation, using rhythms and patterns of words to evoke different atmospheres and tempos that were then interpreted through movement. The project culminated in a performance at Charlton Secondary School where students from both schools shared their work with each other and a very big and supportive audience! This project was designed to enhance a sense of community in Craven Arms and to encourage participants to share their ideas for the future of their area. I teamed up with Fiona Collins to work with KS2 children interviewing local elders about their memories, hopes and fears for the community with the aid of ‘fantastic faces’: faces made from vegetables with paper features on which were scribed local sights, sounds, smells, tastes and memories. The sessions were non-threatening, empowering and filled with laughter. Through preparatory sessions with both the schools and groups of elderly people we were able to match children with interviewees so that all had a positive experience. Leaving the traditional clipboard of questions behind led to more active conversations, while using writing in an unusual and interesting context led to the children gaining new understanding and increased confidence in using the medium, as well as some wonderful cross-generational communication. Our project was to create a nine metre square wall mural with the The Bridge School at their old site to welcome them to their new school as part of the Hadley Learning Community. We worked with14 – 17 year old students with a wide range of physical and educational special needs for a week. The theme chosen by the school was the story of the Wrekin Giant. This story was told every morning with the aid of a specially made storysack, the students telling more and more of the story each time. Each day focused on a different aspect of the story and included a large number of wide-ranging activities to keep attention, enthusiasm and to allow opportunity for all children to shine. For example, one day focused on water. I told a local flood story, and we re-created the flood using lengths of shimmering blue and green material. We then talked about different types of water – puddles, rain, streams, rivers, lakes. With the students inside we threw buckets of water at the window so they could watch the shapes the water made. We went outside and played with trays of water – sketching the shapes the water made when it had a stone dropped in. We added oils to water and made reflective imprints by laying paper on the top. Using wire hoops we made large bubbles and drew the shapes of them. We headed off on a walk to a local pool and looked at all the plants growing around the water and the wildlife in and around the pool. The sketches produced were taken the next day to Jackfield tile museum and used for ideas as our stundents painted tiles which were fired and used in the Welcome Wall. This was an exciting, successful project helped greatly by the enthusiasm of all the teachers and support staff at the Bridge. The staff led by example, supported us in our ideas and extended the project by follow on work after we had gone. Story detectives: children listened to stories from the memory box and played conversational games. We introduced them to methods of interview technique. Children interviewed each other and members of their families. They brought stories back into class and added new objects to the memory box. Storyseeds: children chose stories from a selection told from the memory box and we used these as seeds to create a ‘play in a day’: performances of storytelling, dance, drama and music for children, parents, governors and community members at the end of the day. Storywalks: we took various community groups including the Country Park Junior Rangers Club on walks around the area, telling stories gathered from the community in sites associated with the stories. 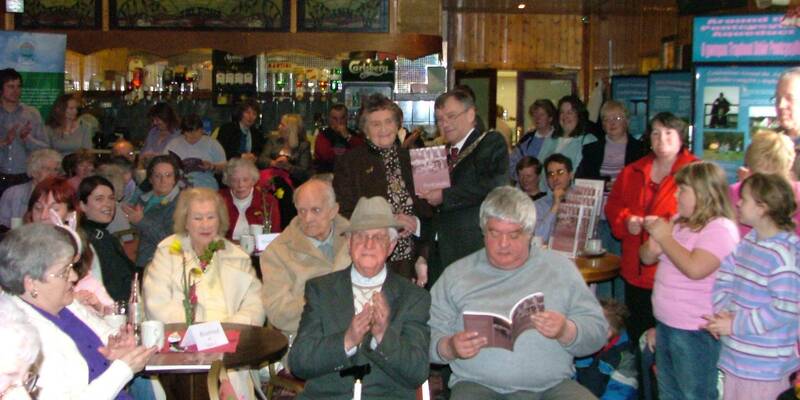 ‘Pontcysyllte Memories’: the project concluded in a book of reminiscences published by Tempus Publishing. We held a grand book launch next to the aqueduct with the mayor of Wrexham presenting each contributor with a copy of the book. The youngest contributor to the book was nine years old. As part of the celebration, children told stories with the aid of the memory box to audiences including the mayor. In November, 2003 Fiona Collins and I gave a storytelling workshop to the Stafford and District Early Years Forum. This session was an exciting opportunity to play and have fun! We have been experimenting with new ideas in the way we approach storytelling to under fives and our biggest discovery has been the use of fruit and vegetables. With the state of the nation’s health and the English aversion to healthy eating constantly in the news we have been aiming to promote fruit and vegetables and how much fun they can be. We have been positively encouraging children to play with their food and using edible puppets as the focus for stories and now it was turn of the adults. 23 early years practitioners fell upon a rather large fruit bowl and set to work to create an amazing display of characters including a pumpkin cat with pomegranate ears, Surfing Spud, Lucy Leek the scary fairy, a courgette crocodile and a very cool Caribbean coconut.